SCHEDULE CHANGE: SCHEDULE MODIFIED DUE TO DUMPSTER PICK UP AND A NEW ONE COMING IN: We will organize a work group for today WEDNESDAY from 5 to 8 to continue removing all the damaged materials, and tomorrow THURSDAY have another 3 till dark to fill the new dumpster. An update on our situation. 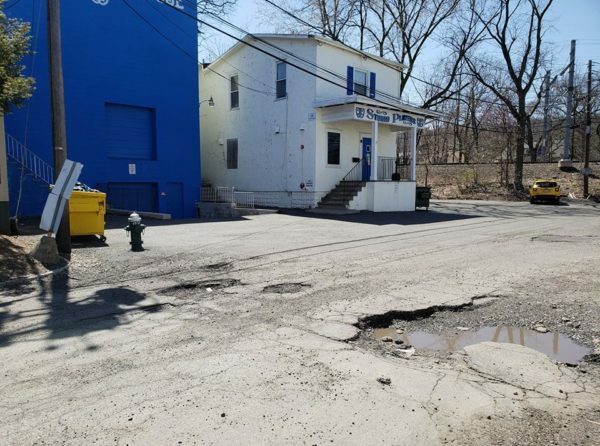 We have obtained the donation of a dumpster thanks the generosity of Louis and Michell Mauriello (owners of Champion Waste Removal in Montclair) who heard about our plight and decided to help. See details on the NBC video and this post to find out what happened. Please invite all the people who have been involved with us and all who wish to assist. If they can’t lift heavy things there are many other ways to help. Dress in old clothing you don’t mind getting dirty and wear closed shoes for safety. 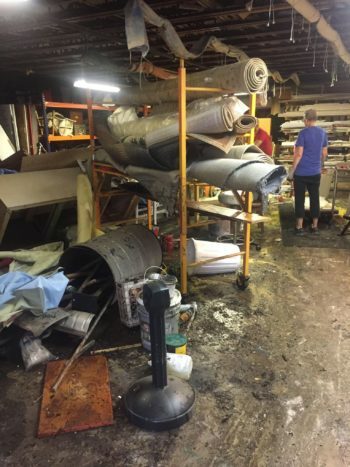 We have not even begun on the prop room where we think there are salvageable items which are in need of sorting and cleaning. 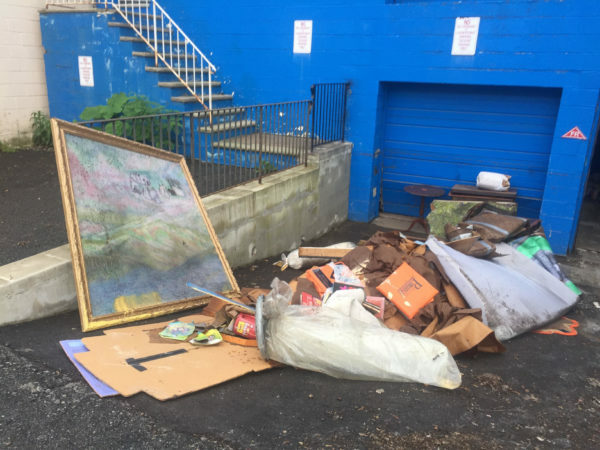 I need a few people with good with spatial relation skills to help supervise the load of the dumpster effectively, we can’t just throw stuff in willy nilly. Work will continue daily until we are done, at a minimum throughout the weekend and possibly the rest of the month. Thank you to all who have been here, all who are working at home or work getting us noticed. Tune in to NBC news at 4 to see Amy Fox and Bill O’Brien talking with Chris Glorioso covering our disaster!! 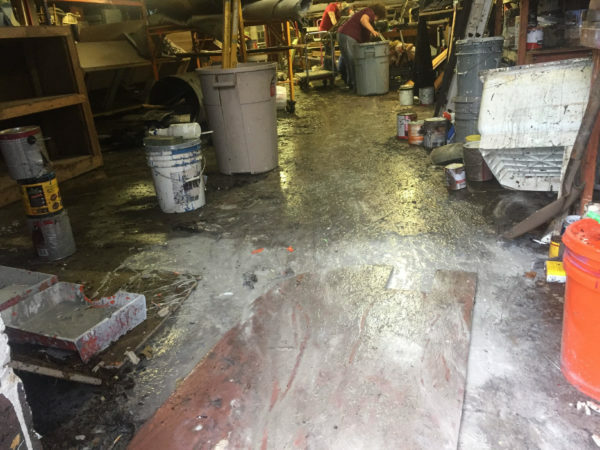 The flash flooding that hit Montclair and the greater Essex County area on August 11 took its toll at Studio Players. Though our performance space, seating, and lobby are well above ground, our furniture and prop storage, scenic shop, and actor’s prep room and heating system are all below ground. 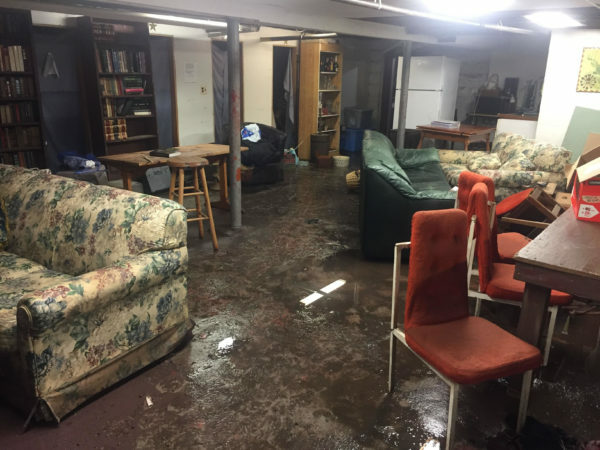 The flood waters entered the building by simultaneously coming up through the drains and via sloping driveway that hasn’t been used in over two decades and forced open what had once been a garage door that had been walled up. It also forced open an adjacent metal, entrance door. 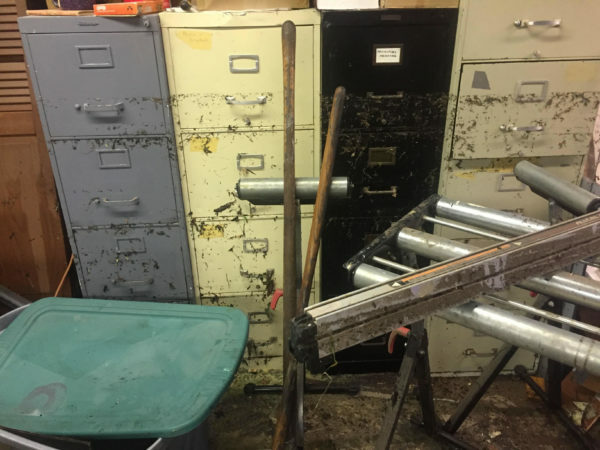 Judging by the high water mark left on filing cabinets where historical records and photos are stored( now a total loss), the water reached a height of over four feet. We are extremely lucky that no one was in the facility at the time, and no one was injured. We have not seen water enter the building on this level since Hurricane Floyd in 1999, and even then, the water didn’t reach this level. Dump sink knocked over and legs collapsed now unusable. 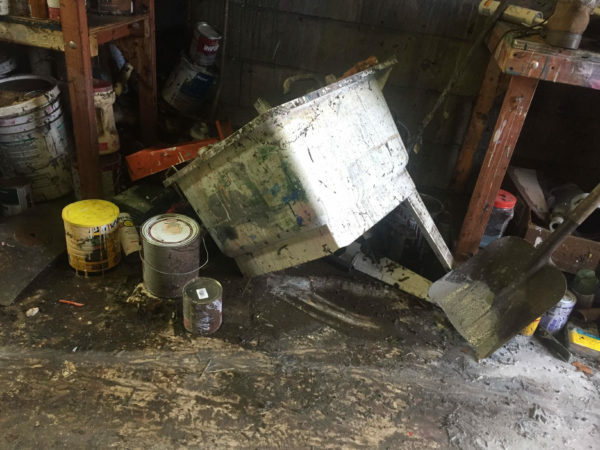 Paint from adjacent shelves crashed to floor paint mixing with mud on floor. The entire collection of upholstered furniture, wooden chairs, vintage kitchen items save for a few pieces on a high rack a complete loss. Much of this furniture was vintage from the turn of the century to the 1940’s. Near as we can tell they were floated off their racks that were 4 inches off the floor (at least) and swirled into a churning mass of debris. The decorative molding, baseboards, railings floated off their shelves and smashed in the waters or harpooned through other items. Stage carpet collection (much of which was vintage persian rugs) destroyed. Also affected was our tennant Essex Youth Theatre whose prop and costume collection is in the same location. We are ordering a dumpster. We’ll update on its exact arrival. We’ll need many hands to get things into it. We have professionals coming in to look at our boiler and heating system to see what if any damage was done by the rising water there. Our gas has been turned off as a precaution. Studio is run as it has always been run by volunteers. We are the community threatre of Montclair and the surrounding area since 1937. NO ONE receives a salary. We are dentists, paralegals, EMTs, teachers, project managers, etc. by day and lovers of performing arts by night. We receive no local, state, or federal funding. Our only source of income is ticket sales and donations. That we use to put on 8 shows a year (4 for adults 4 for kids) with inclusive casting. Please donate to help us. 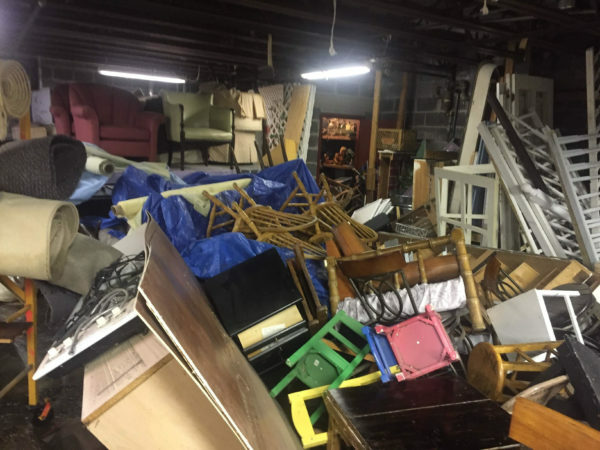 At minimum we will need to pay for a very large dumpster(s), the inspection of our heating system and possible repair, ventilation of the downstairs, and that’s before we even get to cataloging what we have left and figuring out how to best replace it. We are a 501c3. YOur donation is tax deductible and can be made via a check to Studio Players, 14 Alvin Place, Upper Montclair, NJ 07043. You can also donate via PayPal. Order your season tickets today and save as much as 25% off the individual show price. Do you love movies and musicals? We have a special evening planned that’s sure to delight. Join our performers (students and professionals) under the direction of Dr. Darren Gage of William Paterson University in a night where Broadway meets Hollywood. 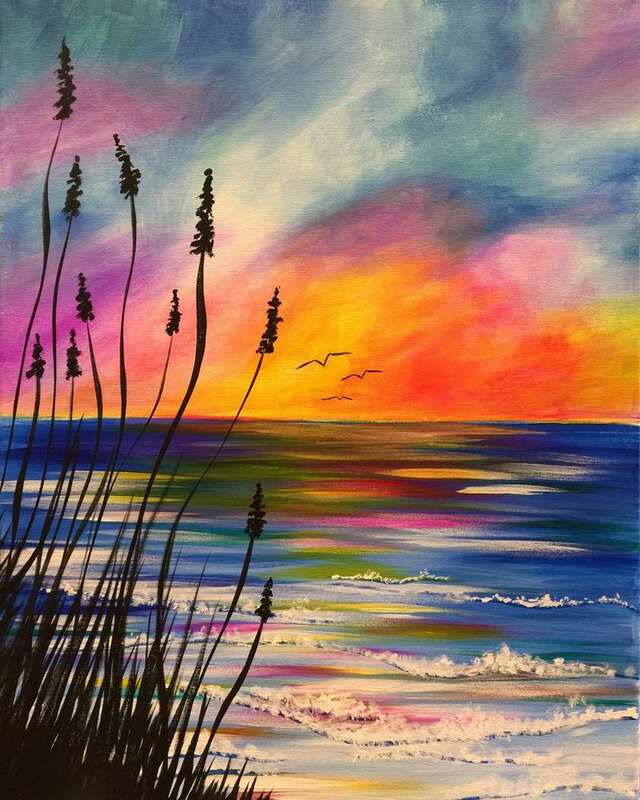 Want to do something creative? Need new decor on your walls? Want to have a good time with friends and meet new ones? 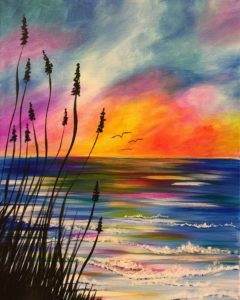 How about coming to Painting It Forward! Every estranged member of the Lafayette clan has descended upon the crumbling Arkansas homestead to settle the accounts of the newly-dead patriarch. As his three adult children sort through a lifetime of hoarded mementos and junk, they collide over clutter, debt, and a contentious family history. But after a disturbing discovery surfaces among their father’s possessions, the reunion takes a turn for the explosive, unleashing a series of crackling surprises and confrontations. 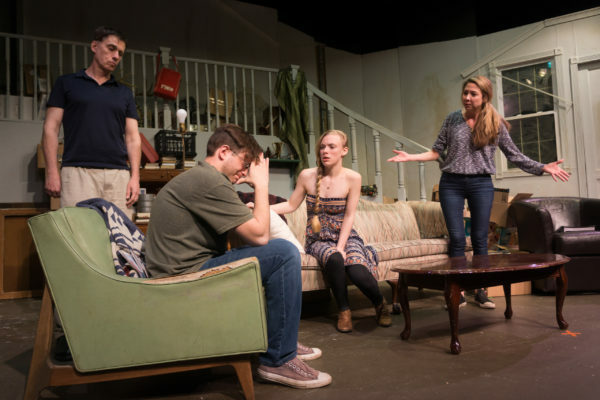 Winner of the 2014–2015 Obie Award for Best New American Play. *Please be advised that this show has mature themes and language. 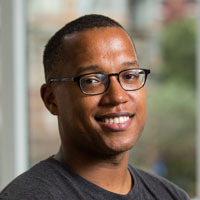 Branden Jacobs-Jenkins is a Brooklyn-based playwright whose credits include War (Yale Rep; forthcoming at Lincoln Center/LCT3), Gloria (Vineyard Theatre), Appropriate (Obie Award; Signature Theatre), An Octoroon (Obie Award; Soho Rep, Theatre for a New Audience) and Neighbors (The Public Theater). He is a Residency Five playwright at Signature Theatre and is under commissions from LCT3/Lincoln Center Theater, MTC/Sloan, and the Steppenwolf Theatre Company. YOu can learn more about Mr. Jacobs-Jenkins here. As you probably know, Studio Players is an all volunteer, non-profit theatre. We have been providing quality, affordable performing arts to the North New Jersey Community since 1937. No one at Studio receives a salary. Everyone involved donates their time and talent to make eight shows a season possible. 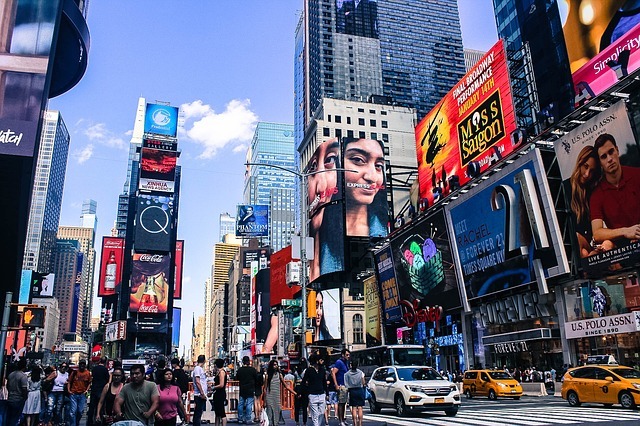 Studio has touched many lives whether it was launching a Broadway career, giving a creative outlet to former actors and designers, fostering a love of performing arts, giving a children their first theatrical experience, and so much more. 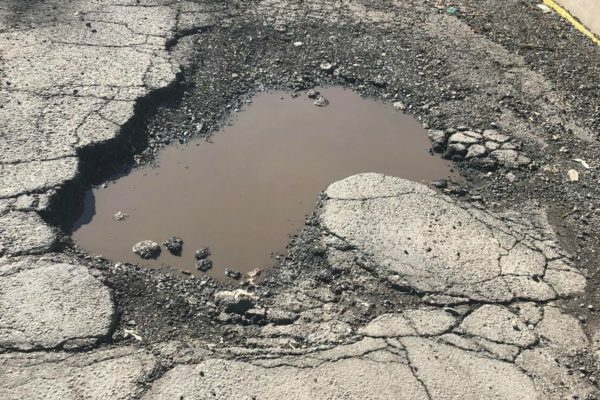 Currently, Studio’s parking area is in need of repair. 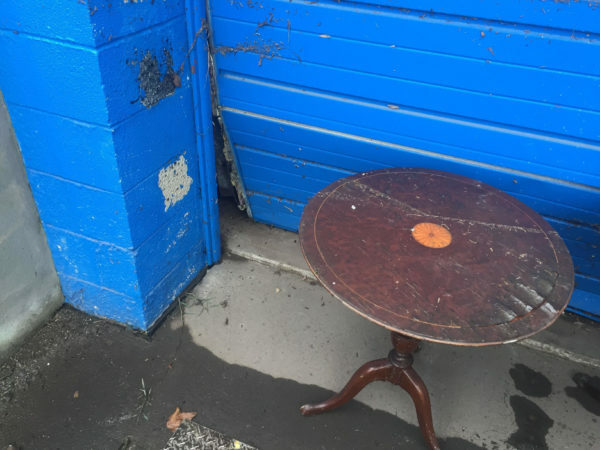 The playhouse has been patching it up for several years, but the winter snows have made a patch up no longer a viable option. The parking area needs to be handled by professional contractors, and this obviously comes at a cost. Many mistakenly believe that the land at the end of Alvin Place is a public street. It’s actually private property and Studio is the owner of part of the tract. As such, Montclair is not responsible for its upkeep. If you’d like to join us in helping Studio to continue providing 8 shows a year at affordable prices you can do so via this convenient PayPal link If we raise more money than needed for the project (it will cost roughly $5,000), it will go towards other expenses associated with maintaining our 100+ year old building. If you’d like to donate in another manner please email us at studiopl@studioplayhouse.org and we’ll put you in touch with our business manager. Thank you in advance from all of us. Even $10 can make a difference. Regardless of your ability to donate, would you be so kind as to share this information on your Facebook page, or email friends and co-workers etc.? Every little bit of getting the word out helps. 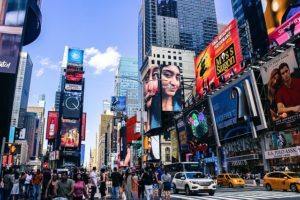 Looking for family friendly entertainment in North New Jersey this weekend? 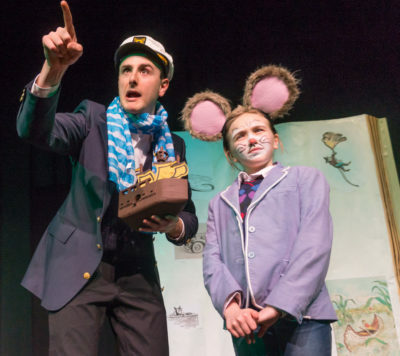 Look no further than Studio Players production of Stuart Little. All of our children’s series shows are appropriate for children aged 2-10. They last approximately an hour, and they are affordable at $8.00 a ticket. The classic children’s story is coming to life on stage! Join everyone’s favorite mouse on a mission, Stuart Little, and his neighborhood friends on Stuart’s many adventures! Boat races, dastardly cats, toy car road trips, and much more await you! 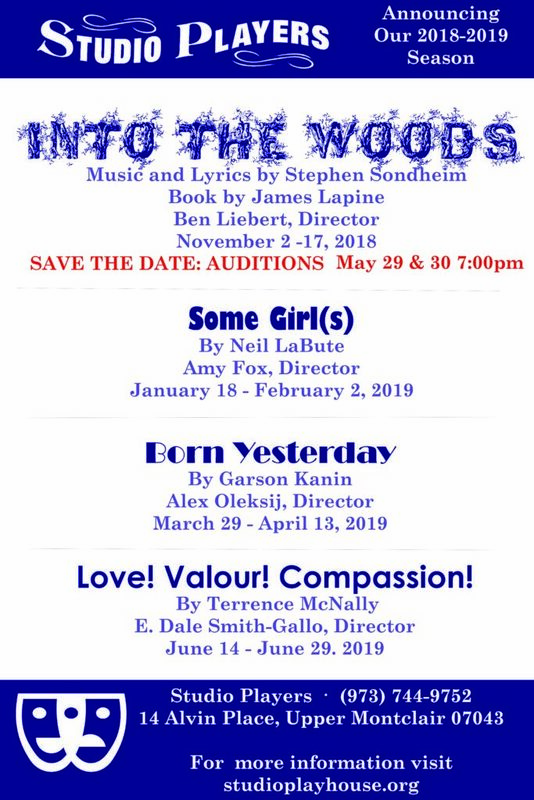 Mark your calendars for some of the best theatre North New Jersey has to offer. Studio Player is proud to announce our 2018-2019 mainstage season. We will be announcing our children’s theatre series shortly. HELP OUT STUDIO ON APRIL 19th!